Lots of students started using iStudiez Pro this year and the word of mouth spreads like fire. Now, today’s model of a nice app is to give the basics for free to satisfy even most careful users, while offering advanced specific features as a paid option for those of you who want more. iStudiez Pro changes to the freemium model on ALL platforms, and it is one of those nice cases when the demand is here and the time is right. This relates first and foremost to the new users: you download the app for free for all your devices, and then if you wish your data to be synched across devices or if you wish to share your schedule, then you purchase the full version on every platform where you would like to sync. Ok, what exactly it means for existing users? Nothing. All you paid for is still there for you, and you don’t have to pay for anything in the app again. IMPORTANT: We have removed the LITE version of the app from the App/Mac App Store. If you can’t imagine your life without iStudiez Lite, you’ll have to think of transferring to full version from now on, your app data will migrate safely. Happy New Year, ladies and gentlemen! 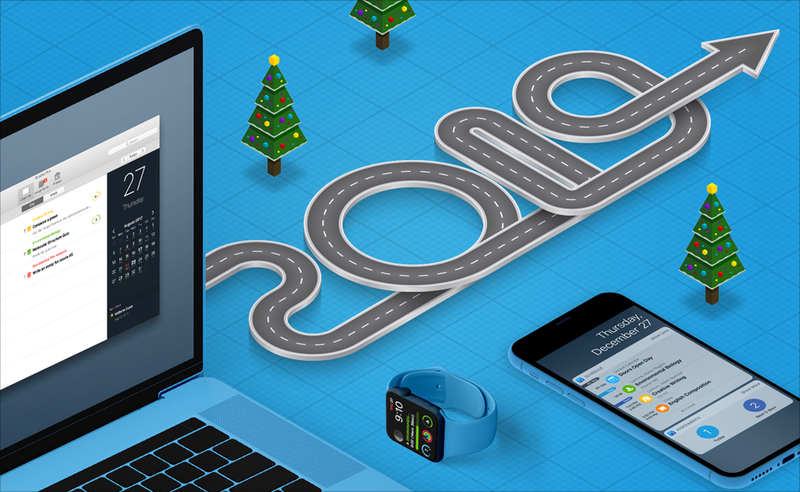 We are happy to enter the 2019 with you as part of our growing family! Perfect match for All-Night Learners! There are many things we love seeing come in this world, and the Dark Mode on macOS Mojave is definitely one of those. How about switching to the soothing-to-the-eye subdued screen somewhere in the middle of the night when you are sitting for your finals and can’t stand the biting shiny interface anymore? We are there for you guys, you know that right? And as we do, this new update should also be warmly met by Apple Watch evangelists! 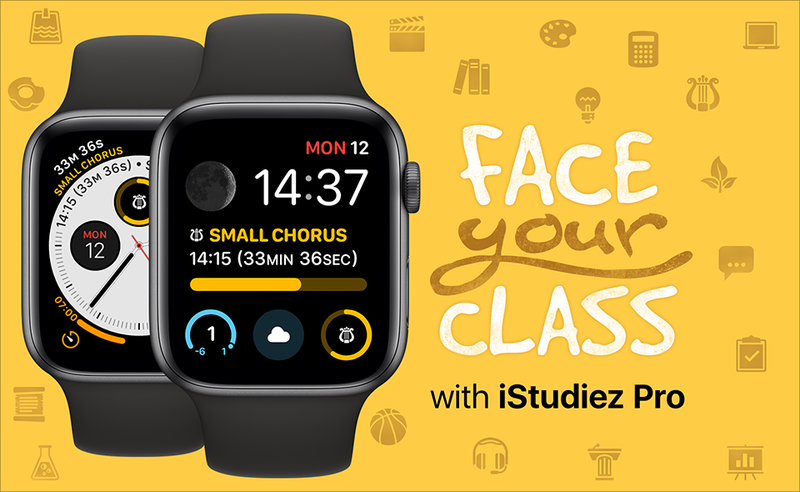 You can hardly deny that the combination of iStudiez Pro and Apple Watch is a definite win. You get all the valuable info on your wrist, you are always notified about the upcoming classes, events & exams and much more! You’d be pleased to know that we fixed minor user interface issues some of you were annoyed with when using the app on new Apple devices. So for those of you who are perfectionists: you’ll now enjoy better the way iStudiez Pro looks on new iPad Pro, iPhone XR and iPhone XS Max. 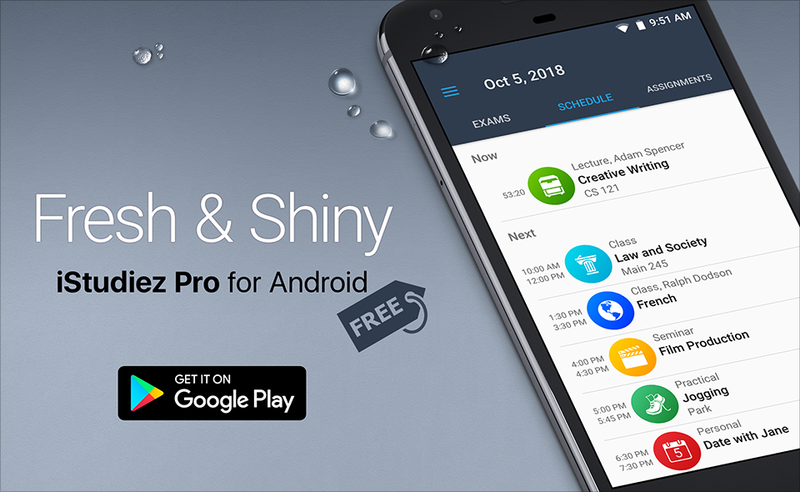 We’re excited to bring you the new and fresh update of iStudiez Pro for Android! First, the biggest news we can’t wait to share with you is that the Android version of the app becomes FREE now. The only paid option is the Cloud Sync service with the related features (like Schedule Sharing). But don’t worry, you are eligible to upgrade for free if you’ve already bought the app from the Play Store before. 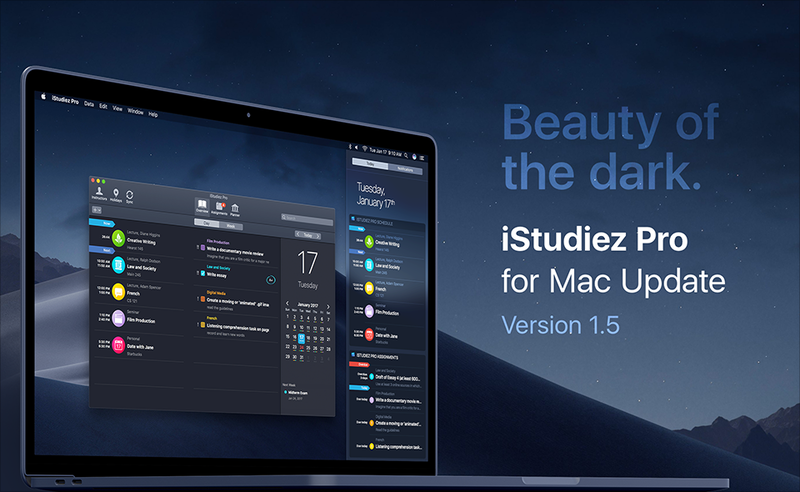 With every new update we keep iStudiez Pro look modern and native on every platform where it runs. Recently we have updated the app for iOS and now it is the turn for its sibling on Android. Meet the new look of icons for you classes and hobbies, including Medical and Recreation icon packs. If you want to keep an eye on your upcoming exams you may now see them in the new Exams tab in the app. And, with the new Course Statistics feature added, you will keep a track of your classes, assignments and grades. And the last but not the least: we have fixed lots of minor, but annoying bugs you might have faced before. 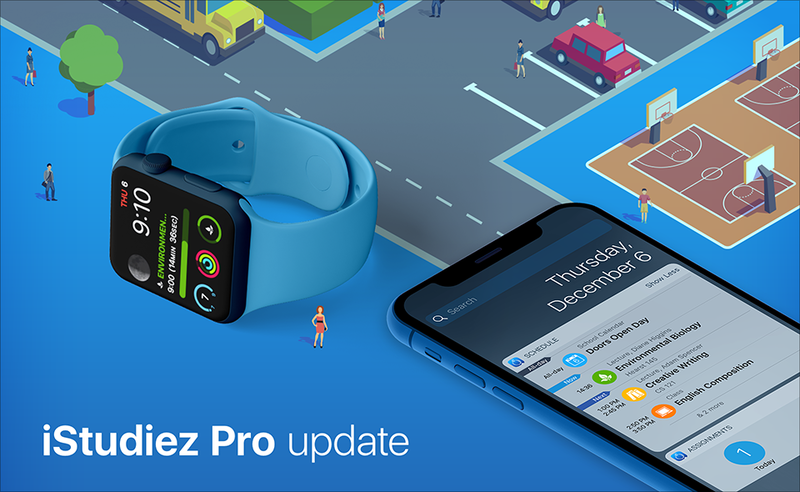 So why not update your iStudiez Pro right now and tell us what you think? Don’t forget to spread the word about the new update among your faithful friends and fellow classmates! The feature you’ve been asking for is now here! Your assignments can be seen in the Week pane of the app for easier planning of your working load. Check when your assignments are due and how much time you have before you should turn them in! Adds to your self-organization and to our karma. Curios about what other great features the new update will bring? Here you go! This update brings you the ability to swipe weeks in the Week pane with your touchpad. Browse your schedule, like, fast and furious! Those red exam days in the Week view became more visible for better differentiation. Be organized like never before! Convert your class into exam event. Do it immediately with just a few clicks, and no need to add a separate exam entry. Simply right click on a class entry in the Overview and check “Convert to exam” option. Voilà! The aesthetic impression of your schedule in the Week pane is not ruined. The refreshed look of the icons in the app. It was quite a while since we updated them, so we fixed that and they look yummy! You may like to know that we have fixed the bug of reflecting the event that lasts for a few days in the Calendar of the app. The dots for the event are now shown for ALL days of the period of duration. Furthermore, the app now takes much less valuable screen space in Full Screen mode, so you can easily use it along with other apps that will definitely improve your workflow. We are always glad to receive your feedback in our blog, Facebook, Twitter or email. You often send us interesting ideas so please keep on doing that. On May 25, 2018 the European General Data Protection Regulation (GDPR) for better protection of EU citizens private data comes into force. Should our users have any questions, please let us know. Otherwise, we will assume you’ve accepted the changes and had no claims whatsoever. It’s been a while since we’ve introduced the Grade Graph feature on Mac. First introduced as an experiment, the Grade Graph turned out to be an elegant and charming way to keep visual track of your grades. Kindly meet the Grade Graph on iPhone and iPad. The Graph pictures your academic progress in real time. It’s kinda easier to see how your grades progress (now we hope they are!) and get a nice visualization of your “studying tendencies”. Now how to find it? You can see it right in the Planner on your iPad. On your iPhone the Planner is the location too, you just need to tap the course in question and switch to the landscape view. The Grade Graph always lets you know whether you do well or it’s time to get your… hm… self to your desk and study hard. Here’s the chronology of what happened to our Cloud Sync service recently. Our hosting provider decided to update hardware & software on our servers as measures to prevent security vulnerabilities. We as client were not able to either decline these services or influence them in any way. Usually such maintenance works are underway no more than 4-5 hours, so the announcement from the hosting provider did not raise any of our concerns. After the maintenance was complete, part of servers were back to normal working order. However, some of the servers were still down. We’ve spent the entire weekend trying to get in touch with the provider to reveal the origin of the problem. The connection with the failed server was completely lost. After 48 hours of silence the hosting company was finally able to clarify the situation occurred. They’ve confirmed that there was a hardware problem (failed HDD) with one of our servers. We were trying to get the data from the failed server and at the same time were in a search of alternatives to our current hosting provider. Despite our multiple requests through all available communication channels, the hosting provider has not changed the failed HDD on the server yet. We have already set up the new server with a new hosting provider. We restored Cloud Sync service back to normal operation. We apologize for the inconvenience caused and thank you for your understanding, patience and cooperation.